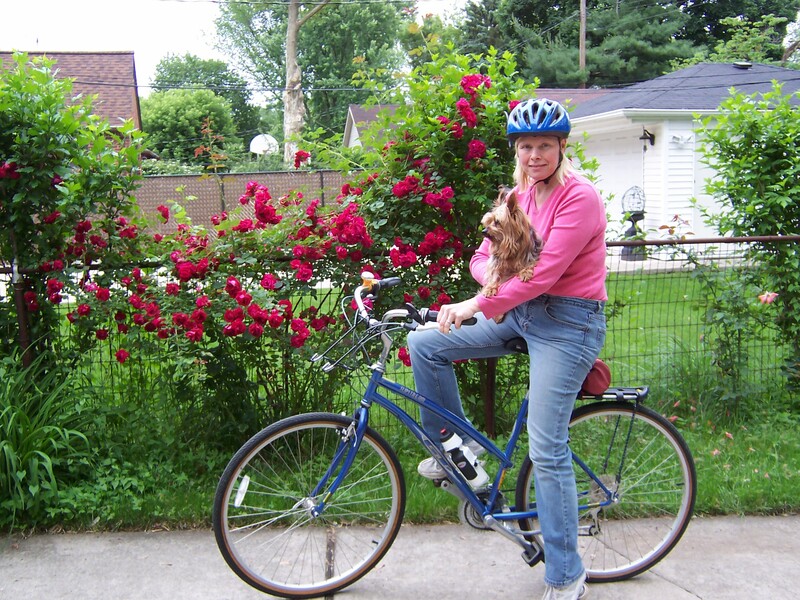 From the Motor City, meet Ann Rappaport, a 48yr old Mother of 3 kids, one Yorkie (who likes riding if you hold him) and a wonderful husband. On and off for 2 years, this summer the family has taken the challenge to ride instead of driving a car. First the exercise, no matter how much you say you get you really aren’t exercising that much. I only ride 5 miles round trip, taking a car is lame. Second to set an example for our kids one who is very much into biking and the other who rides a 3 speed “Freespirit” in mint condition. I can’t say the price of gas is a huge savings, but the mini van can sit all day long now, which is nice. I even got into it one day and realized it felt odd, like someone had moved the seat and forgot to put it back! As everyone knows riding through a neighborhood is relaxing before work and after. I teach water aerobics and water arthritis classes in a suburb of Detroit, Michigan. The only bike I have is the only one I bought just for me. It’s a GT Slipstream, blue. I have a friend/student who is older than me. A wild guess would be 70 years old. She had wanted a bike for well over a year. I kept telling her I’d find her one at a yard sale. This spring I found a Caloi, made in Brazil, a cruiser, 6 speeds, just what she wanted, for $25. It was in great shape. I kind of wanted it myself. She is now riding with her granddaughter to the store and to meet me at the pool or for coffee. Our deal is she has to sell it back to me when she no longer rides it. No not really unless you count my family as an advocacy group. I’m cheap and wanted to carry more than one basket would hold. 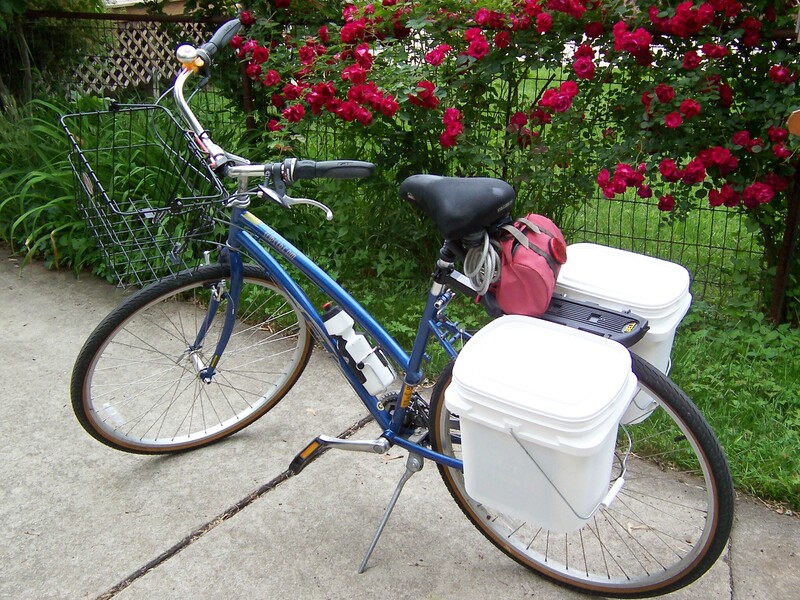 I made panniers out of kitty litter buckets, very similar to the ones you showed from the commuters expo, except I used hooks to hang them from the back rack. They come off when I am not using them. The kids were really glad I painted them. Otherwise I would have been riding around with “Fresh Step” buckets hanging off the bike looking like a crazy person. Thank you Ann for submitting your profile, we’ll be sending your stickers soon! haha! I got a good laugh out of your kitty litter panniers, Ann! By the way, that was a “respect for your innovation” laugh. That’s an ingenious little setup! That bike and those stories warm the darkest chambers of my heart. I’ve got a soft spot for awesome DIY “grocery gitters”!!! Bravo for influencing an older person to get back on a bike (and to take water aerobics). Thanks for your profile, Rapps! Those bike buckets are totally functional and cool in their own way. Keep it up. you rock. I feel so violated, I thought I came up with the fresh-step cat litter panniers buckets…exactly the same, except mine are covered in a layer of duct tape, with reflective highlights. You’re right about the relaxing qualities about a ride to and from work. I feel better at both ends of the trip. Also, those cargo buckets look quite handy. I may have to work on a set for myself. I posted the complete project here, not in any usable order, but with comments that are enough for this easy project. I didn’t come up with this idea, but gave credit on one of the pictures to the site where I ripped it from. I rode in the rain last week, yes fenders would have been very helpful to say the least! mercutio stencil- reflectors good God I’m off to the store to get some or the tape. I like the idea of spray painting them to match/go with the bike hey why don’t I put some biking stickers on them? Ann, a couple of snazzy Bikecommuters.com stickers are headed your way. They’d look dashing on those bucket panniers! As for reflective tape, see if you can’t find something called “conspicuity tape” at the auto parts store. That stuff BLOWS AWAY any other reflective tape (it’s the stuff they use to mark the car guard on the back of a semi-truck). It usually comes in a pair of red/silver sheets and has incredibly strong adhesive. +1 on the conspicuity tape! I bought a flexible reflector strip kit, cut the strips up, and stuck them all over my fenders and a bit on the frame. Red for facing backwards, silver for facing forwards! You can also be creative and make cool reflective designs on your bike. The only problem is that if you want to remove the stickers, you will have a hard time getting the sticky glue off your bike. I finally got around to posting mine. Hey Mercutio Stencil, I checked out your instructables, great job. Next time I’ll design them for the front-excellent. I’d do it now but I am already referred to as the “pack mule” by some of the family.